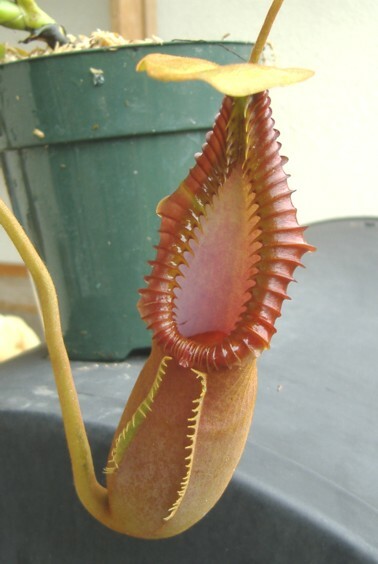 Nepenthes macrophylla is truly a stunning Nepenthes. N. macrophylla has that highly ridged, toothy peristiome and is similar to N. edwardsiana and N. villosa for which it is a sub-species of. There are a few varieties that are available and mostly are from tissue culture. I think Wistuba has two clones in tissue culture and am not sure how many clones BE has in tc. BE at one time offered seed grown plants before going into tissue culture and that's one that I'm growing. Also some seed grown plants came up on Ebay (2010) that were in high demand and went for around $200.00. This is a slow growing species and takes its time to get large. Even grown outdoors in my highland conditions, I have lost small plants to climate and disease. It's not known as a difficult species to grow, but going from tc to outdoor conditions with slow growing highlanders takes time and loss is to be expected. Because this species is so spectacular, slow growing, and unavailable from rooted cuttings, prices remain in the collector's plant price range. Hopefully in the future hybrids besides N. X trusmadiensis will start becoming more available and I suspect Exotica will be the ones to introduce it.